To look like a princess! 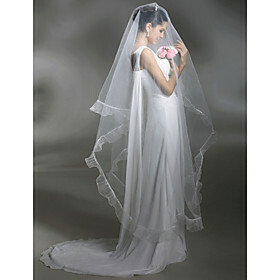 Find cheap long bridal veils online at wholesale prices and other gorgeous wedding accessories at great prices. Want to look like a real princess on your big day? Long veils are known as cathedral veils as they are commonly worn at church weddings and look truly stunning as the bride walks down the aisle. But you don't necessarily need to get married in a church to wear one of these stunning veils that I've just discovered. Our trusted custom made wedding dress supplier is now offering a range of affordable wedding accessories too so I've picked out some gorgeous cheap cathedral wedding veils that I think you'll love. Either see the entire collection of wedding veils at a glance or pick one of my favorites below. Prices start from under $20 - click on the Buy/More Info buttons to purchase or make an enquiry. Material: Tulle. Style: Cathedral. Veil Length: 1 Layer 118.1 inch. Embellishment: Lace. Shown Color: White. Net Weight: 0.16kg. Shipping Weight: 0.3kg. NB: Tiara is not included. Material: High Quality Tulle From USA. Layers: 1. Veil Length: Cathedral, 196.90 inch, Approx. 500 cm. Veil Brim: Pearl Edge. Embellishment: Applique. Color: White. Net weight: 0.25KG. Shipping weight: 0.45KG. Note: Tiara is not included. 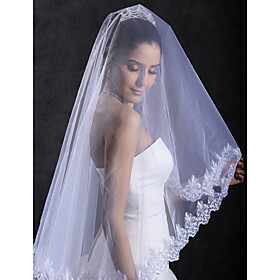 GORGEOUS 1 Layer Cathedral with Lace/ Beading Wedding Veil (WAV0024) - look like a princess! Material: Tulle. Veil Length(inch): Cathedral, 118 inch. Embellishment: Lace, Beading. Shown Color: Ivory. Net Weight: 0.3KG. Shipping Weight: 0.5KG. Tailoring Period: 14-16 working days. Shipping Time: 3-8 working days. Material: High Quality Tulle From USA. Layer: 1. Veil Length: Cathedral, 118.10 inch. Approx. 300 cm. Veil Brim: Pencil Edge. Color: White. Net weight: 0.25KG. Shipping weight: 0.45KG. Tip: Order a beautiful tiara with one of the above long bridal veils at the same time from our wholesale supplier's tiara and headwear collection.